At European Bathrooms, we’ve been designing family bathrooms for over two decades and have planned, supplied and installed hundreds of versatile yet beautiful bathroom spaces. Here we guide you through the key elements to consider when creating a stylish family-friendly bathroom. Space-saving Bathroom Design – Start by looking at the size and layout of the room as this will show which fittings and storage it can accommodate. If dimensions and budget allow, it’s best to install a separate bath and standalone shower. As well as great for multi-tasking and speeding up children’s bath time, a separate bath and shower adds a touch of luxury, particularly if you opt for a free-standing modern or classic roll-top bath. Additionally, as a sought-after feature, investing in both will help maximise your home’s appeal and price, should you decide to sell. If space is tight, an over-bath shower works as just well, plus there’s no need to compromise on style either. A double-ended bath, extra deep or P-shaped bath will look great and give the extra space you crave. To prevent water splashes, add a modern, elegant glass bath screen – we carry Merlyn bath screens which come in a vast array of designs. Whether you’re starting with a blank canvas or an existing bathroom, our expert designers can help you plan and visualise your room for the perfect layout. Complete the form for a free in-house or at home design appointment, or drop in to our Amersham or Windsor bathroom showrooms. Merlyn bath screens are practical, space-saving and stylish. 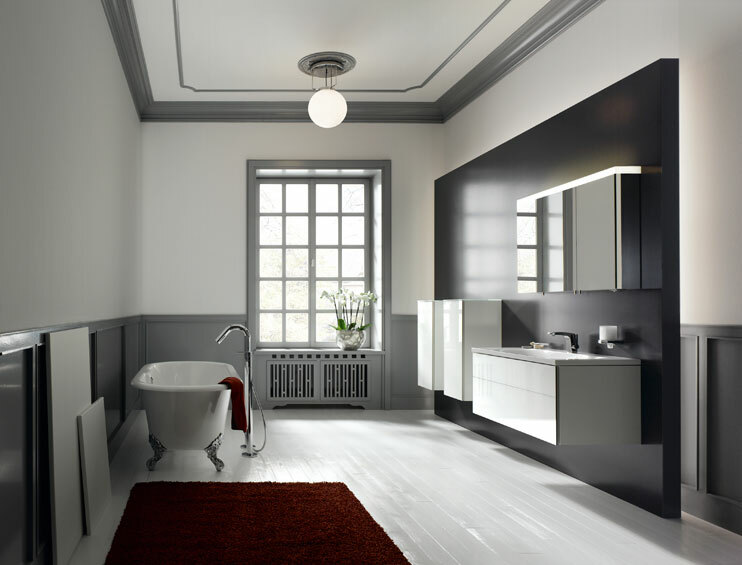 Pop into European Bathrooms to see our range of designer baths and bath screens. Storage Solutions – Bottles, sponges, towels, water-squirting whales – if there’s one element a family bathroom needs plenty of, it’s storage. If space is an issue, utilise the height of the room as opposed to its width. For example, one area that’s often overlooked is around the washbasin. As well as installing a vanity unit underneath the basin and mirrored cabinet above, maximise storage by adding matching units either side. Bathroom designers, such as Keuco, offer a wide range of beautifully crafted modern, minimalist bathroom furniture, including their Royal Reflex range which comprises vanity units, mounted washbasins, tall and middle units and mirrored cabinets – perfect for banishing clutter. Each item can be finished in a subtle tone of white, anthracite or truffle and you never need to worry about catching tiny fingers as doors and drawers close softly and silently. Keuco Royal Reflex bathroom furniture is ideal for a stylish family bathroom – elegant, practical and easy to clean. Wall and Floor Tiles – Porcelain and ceramic tiles are the ideal wall and floor covering for a family bathroom. As well as hardwearing, waterproof, and easy to clean - so there’s no danger of microbes and other nasties hanging around - they’re also available in assorted colours, styles, shapes and finishes. This means you can create the exact impression you want, from the natural charm of large format stone tiles to intricate mosaic patterns for an exotic holiday feel. Most bathroom tiles are glazed which means that they will remain water resistant and looking good for many years to come. Villeroy & Boch’s wall and floor tiles and are a smart choice for creating a visually stunning yet practical family bathroom. 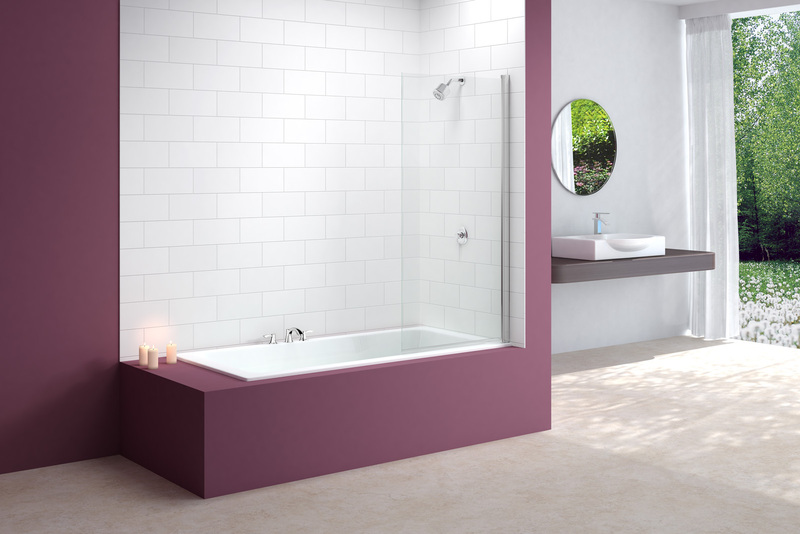 A separate shower area and bath featuring Villeroy & Boch’s AVALON wall and floor tiles – perfect for a busy bathroom by day and relaxing soak by night. European Bathrooms has a wide selection of luxurious baths, showers, bathroom furniture and tiles. To see the latest bathroom products or take advantage of our FREE bathroom design service, call in to our modern Amersham or Windsor showrooms.